INTRODUCTION SESSION: 1 ½ – 2 hours introducing larger groups to the global manufacturing situation and principles of Kaizen (continuous improvement), Waste Free Manufacturing and 5S (workplace organization and cleanliness). The video “Kaizen Toast” is viewed and discussed. 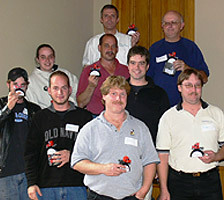 This presentation can also be seen as a forerunner to the 6-hour workshop. Maximum group size is based on your venue’s capabilities. Suitable for lunch-hour, before or after work. 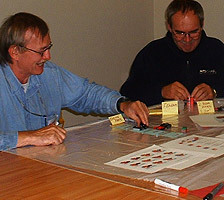 SIMULATION WORKSHOP: Huron Solutions developed a 6-hour hands-on workshop to introduce companies to the concepts of Waste Free Manufacturing, Kaizen (continuous improvement) and 5S (workplace organization and cleanliness). 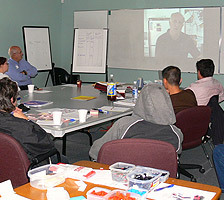 Participants are guided through a series of activities including principles, case studies, videos and a hands-on manufacturing simulation game. Suitable for management, supervisors and shop floor employees. Size: 6 – 12 participants. LEAN ADMIN: This introductory 2-hr session focuses on admin and information processes in any organisation and how to apply lean principles to improve the efficiency of your company. 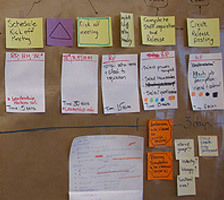 Understand the eight wastes in the admin world and where to find them in information. Find out where to start with your lean improvements. Size: up to 20 participants. Suitable for people working in administrative and information settings. LEAN CONCEPTS SERIES: : This series of three 45-60min sessions was developed to introduce Lean concepts to shop floor in manageable chunks and create an opportunity for employees to identify waste and start the continuous improvement process. Ideal group size is about 8 to 10 people. Option: S: Supervisors are equipped to deliver these sessions to their employees so that they can continue the waste identification and elimination in a structured way. 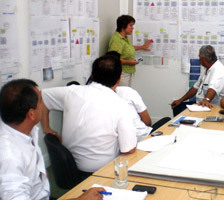 24 LEAN MODULES: Click here for a brief description of modules that can be drawn from depending on the needs of the organization. 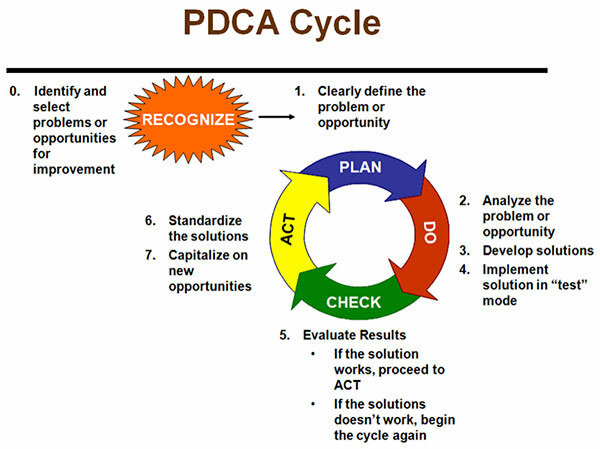 R-PDCA refers to Recognize (project / initiative identification and prioritization), Plan, Do, Check, Act cycle. P=Primary; S=Secondary. The modules vary between 30 min and 3 hours.